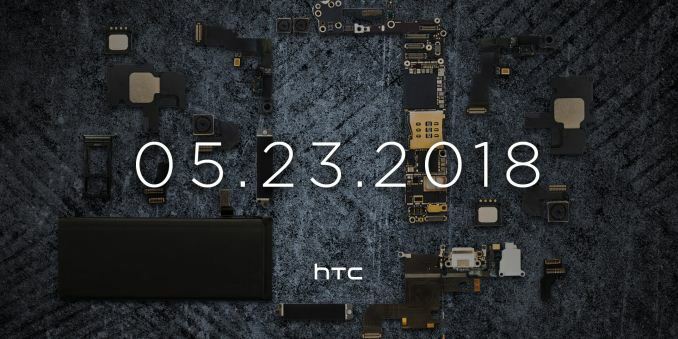 HTC has begun to ramp up their marketing campaign for their next major smartphone release, teasing that they will be making a proper announcement on May 23rd. In an email sent to the press this morning and posted on their website, HTC posted a photo of neatly laid out phone components, with the text “Coming Soon... A phone that is more than the sum of its specs.” The photo and the announcement give a May 23rd date for more details. This announcement is about HTC’s next flagship smartphone, which would presumably be the HTC U12. HTC launched the current U11 almost exactly a year ago in 2017, so the time is ripe for HTC to bring out its successor. It’s an interesting choice for HTC to opt to show the components of the phone, but show nothing about the body itself. The components include a number of camera modules, so like other flagship vendors it would seem that HTC is looking at going the dual camera route. Meanwhile any markings on the primary SoC have been edited out, though as a long-time Qualcomm customer it’s practically a foregone conclusion at this point that HTC will be tapping Qualcomm’s Snapdragon 845. Otherwise, we’ll have to see just what HTC has in store in a few weeks. We're glad people are studying our teaser so closely. The fact people have noticed parts from different phone models is exactly right – they represent the jumble of parts (specs) that our competitors inelegantly cram into their phones, while the space in the middle outlining HTC's next phone represents 'a phone that is more than the sum of its specs. is funny (if you are not the owner) to bump the phone real hard and nothing happens but a small grain of dust will shatter the supposedly crazy tough glass like it is made of like confetti. They mean it is going to be really expensive. The M7 used a mid range SoC didn't it? I still have one and it runs just fine. If they have gone for mid range parts and spent time really optimising it, they could be onto something that's a bit cheaper but performs really well.